To some, installing landscape lighting in your yard might seem like a weekend warrior, do it yourself (DIY) project. In fact, most of the local “big box” retailers have created an entire aisle in their store dedicated to the DIY market, which consists of cheap, easy to acquire lighting fixtures and power centers. The problem is homeowners who purchase these products may have unrealistic expectations, thinking that their project could look as good as the neighbor’s house across the street, who just had a professional lighting system designed and installed by Lighthouse Outdoor Lighting®. Let’s examine a few reasons why DIY systems will never look or perform like a Lighthouse® system. When you pick up a DIY light fixture at the store, you may think because it’s made of metal, it must be of good quality; when in fact, what is lying just under that nice paint job is some of the lowest grade pot-metal that can be produced in China. What may look good today will chip and corrode in a matter of a few years due to the extremes of weather and UV radiation. A Lighthouse system uses only the highest grade of cast brass, Copper and Stainless steel in the construction of our lighting equipment. Metals that have proven they can take the elements and stand the test of time. One thing the DIY lighting industry has done for homeowners, has been to make hooking up and connecting lights very easy. They have devised a connection that is squeezed together, thereby pushing two simple, metal points together through the wire jacket and into the wire. This is called a “pierce-point” connection. While this may be an easy connection to use, it also provides no waterproofing and now has punctured the wires only means of protection against oxidation due to water, soil minerals and air. When we remove these systems, we find the #1 failure point is found in the connections of these low-quality systems. A lighthouse system will never fail at a connection point. Our connectors are 100% waterproof with high strain relief, so they can never be pulled apart. We believe that the part of your lighting system you don’t see underground is equally as important as what you do see above it. Within the last 7-8 years, when I would mention the word LED, it would be followed by an “Oh no, I don’t care for that cold, blue light”. I was a slow adopter of LED light sources for that very reason. I wasn’t going to put a product out there on a client’s property unless it closely matched the results of the light that came from a traditional halogen light source. 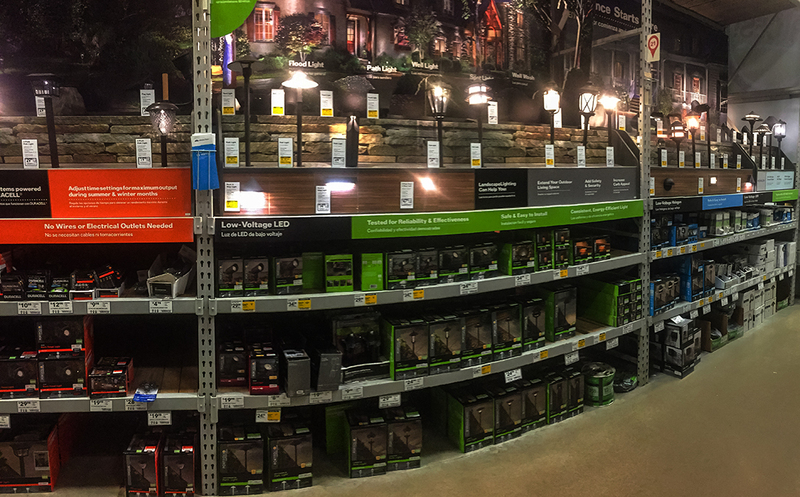 I will say that LEDs have been there now for a while in the professional segment of the lighting industry, but the DIY market is still lacking as it pertains to landscape lighting. This is simply due to the cost of producing LED chips with a high, color rendering ability. DIY products are cheap and look cheap because they skimp in this area and will always render a cooler light with a blue tone. Lighthouse® doesn’t skimp on our LEDs. In fact, we have created our own line of LED products that meet our rigorous standards for color temperature and color rendering ability, which leaves our clients homes looking warm and inviting and not spooky and cold. Believe it or not, that inexpensive package of lights and the power center you purchased at the home improvement store are built with planned obsolescence in mind. This is a trick that the retail manufacturers play to draw you in with the cheap products, then build them and plan the installation methods in such a way that they fail in a short span of time, causing you to keep coming back to them to replace worn out or defective equipment. At Lighthouse, we think this is a very underhanded tactic and it has given the low voltage lighting industry a bad name. When you hire Lighthouse to design and install a custom lighting system, we never short change our client’s by cutting corners on the quality of the equipment we use and even more importantly, how we safeguard the system for longevity underground. We expect our lighting systems to simply work flawlessly night after night, which is why we back it with the industry’s most comprehensive warranty. Do it yourselfers will never be able to compete with a professional, Lighthouse Outdoor Lighting® creation for the simple reason that you will never be able to purchase artistry in a box. Our Lighthouse designers have all undergone extensive training in lighting design along with many certifications in master design. Our designers know exactly how to assess your home and property to create the most visually stunning scenes at night because that is our passion and it’s the only thing we do. A beautifully lit home and landscape consists of far more than the sum of just its parts. Unfortunately, you will never find a box labeled expertise, passion and experience sitting on the shelf at your local home improvement center.